Four months ago, shortly after President Donald Trump's Twitter account sent out an image suggesting Deputy Attorney General Rod Rosenstein should be prosecuted and imprisoned for appointing special counsel Robert Mueller, the president took the rare step of telling Rosenstein it was a mistake, according to a former Justice Department official informed of the conversation. As described by the former official, the mea culpa came in a private phone call, within days of Trump retweeting the meme that showed Rosenstein, Mueller and several Obama-era officials behind bars. "[W]hen do the trials for treason begin?" the Trump-endorsed image asked. But on the private phone call afterward, Trump insisted to Rosenstein that he didn’t notice the veteran prosecutor in the image's background before it was retweeted, according to the former official. Publicly, Trump stood by the controversial post. The previously unreported anecdote reflects how — despite unrelenting attacks on Mueller, Mueller's team and others at the Justice Department — Trump often tried to avoid clashes with Rosenstein, the person who appointed Mueller in the first place. "There was a healthy respect between the two," Ian Prior, a former Justice Department spokesman under the Trump administration, told ABC News. "The bottom line," according to Prior, is "despite everybody's concerns" that Trump was trying to derail the Mueller probe, "at the end of the day, he really just let the investigation run its course, and he respected Rosenstein as a person." Last year, Trump's outside advisers reportedly wanted the president to take a harder public stand against Rosenstein. But appearing on Fox News at the time, Trump's attorney Rudy Giuliani offered this philosophy: "Rod Rosenstein is one of the people in charge of this case, so I'm not going to get involved in critiquing his conduct unless at the end we have to." As a Trump nominee and long-time Republican, Rosenstein wasn't just overseeing Mueller — he was also in charge of carrying out Trump's political agenda at the Justice Department, organizing federal efforts to fight terrorism, illegal immigration and gang violence. "[Rosenstein] was able to develop a good rapport with the president on things outside of the Mueller investigation," Prior said. 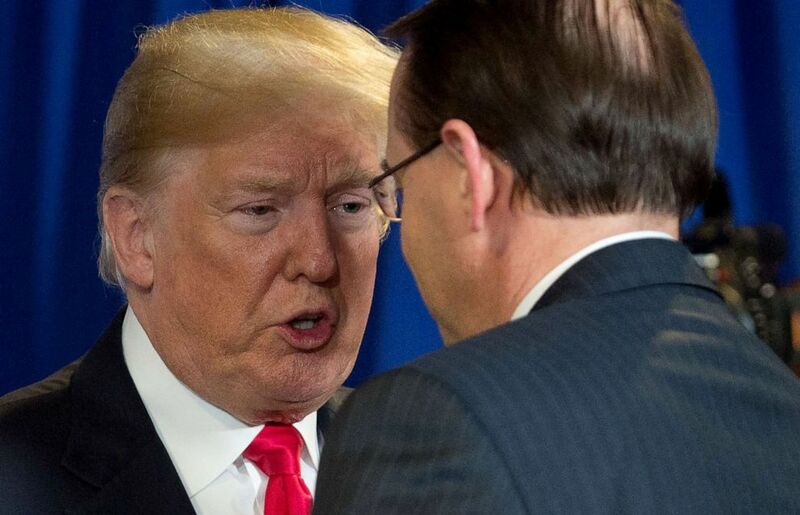 President Donald Trump speaks with Rod Rosenstein during a roundtable discussion on immigration at Morrelly Homeland Security Center in Bethpage, New York, May 23, 2018. From the start of Mueller's probe, Trump was more willing to criticize his then-attorney general, Jeff Sessions, than his deputy attorney general. To Trump's great dismay, Sessions had recused himself from overseeing the growing probe of Russia's meddling in the 2016 presidential election because of his previous work on Trump's campaign, forcing Rosenstein to handle the matter. At a press conference on May 18, 2017, the day after Rosenstein appointed Mueller, ABC News' Jonathan Karl asked the president for his reaction to "Rod Rosenstein’s decision." "Well, I respect the move," Trump responded. "But, the entire thing has been a witch hunt." In the nearly two years since, Trump posted more than 50 messages to Twitter criticizing Mueller specifically or invoking Mueller’s name to attack the investigators looking at alleged ties between Trump's associates and Russian operatives. Mueller was the face of the investigation and the one driving it, but even Sessions — who had no role in the investigation — was chided by Trump at least 16 times on Twitter. By contrast, Trump posted three messages targeting Rosenstein by name, according to an ABC News review of online archives cataloging the president's tweets. At times, Trump even promoted Rosenstein as proof of his own innocence. Last year, Trump cited Rosenstein’s early push for the removal of then-FBI Director James Comey to dispute growing allegations that Comey’s firing in early May 2017 was intended to stop ongoing FBI investigations. "How could there be obstruction on firing Comey, when the man who’s in charge of [the investigation] wrote a letter that was far stronger than anything I would have written?" Trump said in a January 2018 interview with the Wall Street Journal. When Rosenstein then announced charges against 13 Russians for allegedly spreading false information ahead of the 2016 election, Trump highlighted Rosenstein's "news conference" and tweeted this quote from him: "There is no allegation ... that any American was a knowing participant in this illegal activity." As Trump recently described it, he and Rosenstein maintain "a good relationship" because "we work on a lot of [important] things" together. At public events last year, Trump called Rosenstein one of the "great" members of his administration and thanked him for working "so hard" on threats to public safety. That praise for Rosenstein, however, has coincided with Trump's praise for Rosenstein’s sharpest critics, too. In particular, Trump has applauded Reps. Jim Jordan, R-Ohio, and Rep. Mark Meadows, R-N.C. — two fiery Republicans who launched a battle against Rosenstein to obtain government documents and information they suggested would show the Justice Department abused its power in investigating Trump's associates. One thing they wanted to know more about: a classified document Rosenstein signed authorizing Mueller's investigators to continue eavesdropping on a former Trump adviser. In early April 2018, Trump tweeted one of his rare public criticisms of Rosenstein, calling Rosenstein "conflicted" for signing the document. Less than 14 hours later, Jordan declared on national TV that Rosenstein might need to be impeached or fired. 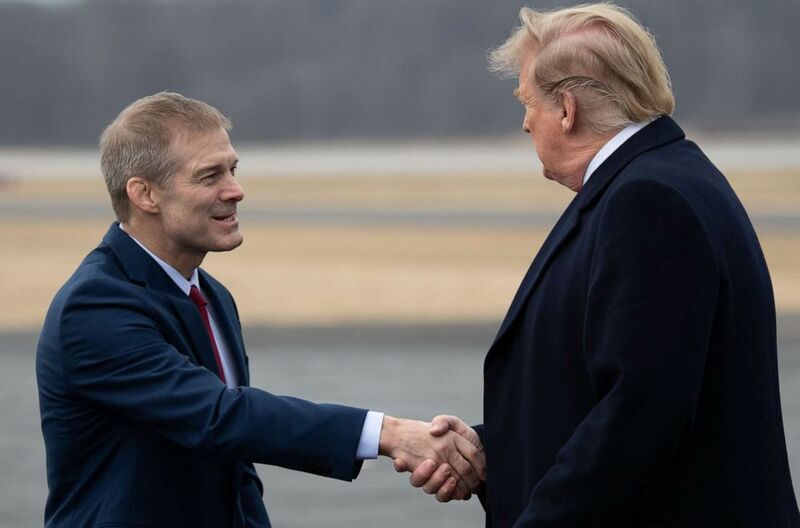 President Donald Trump shakes hands with Rep. Jim Jordan as he disembarks from Air Force One upon arrival at Lima Allen County Airport in Lima, Ohio, March 20, 2019. When White House spokeswoman Sarah Sanders was then asked about Rosenstein's fate, she said Trump was "consulting" with "a lot of different lawmakers" on the matter. "The president would like to see the requests of Congress to DOJ met," Sanders later said. Ultimately, Jordan and Meadows tried to remove Rosenstein themselves, filing articles of impeachment in July 2018 that accused the deputy attorney general of "high crimes and misdemeanors." Republican leaders, however, blocked the impeachment effort, and as the political tussle with Rosenstein continued, Trump appeared on Fox News in October 2018. "The rumor is that the day after the midterms, you're going to fire [Rosenstein]," the anchor noted to Trump. "Well," Trump responded, "I actually get along well with Rod." But Trump quickly added: "We have a witch hunt going on," and "smart, tough guys" like Jordan and Meadows are "folk heroes" for working "to get to the bottom of it." According to sources close to Rosenstein, there was a "tense day" six months ago when Rosenstein was convinced he would be fired by the day's end. News outlets were reporting that, in meetings after Comey's departure a year earlier, Rosenstein raised the possibility of secretly recording Trump or invoking the 25th Amendment to remove him. But Trump, attending the U.N. General Assembly in New York, ultimately took a phone call from Rosenstein, who disputed the news accounts. At the time, sources told ABC News that the controversial remarks being reported were likely in jest. "He said he has a lot of respect for me," Trump recalled three days after his call with Rosenstein. "He was very nice." "My preference would be to keep him and to let him finish up," Trump concluded. 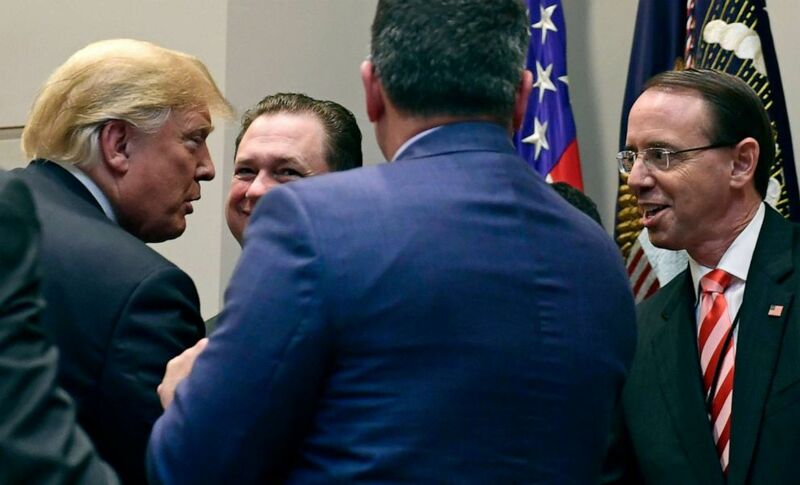 President Donald Trump, left, shakes hands with Deputy Attorney General Rod Rosenstein, right, following a signing ceremony in the Roosevelt Room of the White House in Washington, Oct. 10, 2018. So, Justice Department insiders were surprised two months later when the image of Rosenstein and others locked in a jail cell appeared on Trump's Twitter feed. "Why do you think he belongs behind bars?" a New York Post reporter asked the president hours after the Twitter post. "He should have never picked a special counsel," Trump said of Rosenstein. That was Trump’s public story, despite what he privately told Rosenstein afterward, according to the former Justice Department official. Three months later, discussion of the 25th Amendment resurfaced after former FBI deputy director Andrew McCabe claimed in media interviews that he personally heard Rosenstein make the remarks attributed to the deputy attorney general months earlier. That prompted Trump to fire off his third and final tweet targeting Rosenstein by name, accusing Rosenstein and McCabe of "planning a very illegal act." The same day, the Justice Department announced that Rosenstein planned to step down in the coming weeks and that a likely successor had already been picked. Just days before Mueller sent his final report to Rosenstein two weeks ago, Trump did something he'd hardly done before: He belittled Rosenstein in front of TV cameras. Trump insisted "people will not stand for" a report from 13 "angry Democrats" and a "conflicted" special counsel, who was appointed by "a deputy that didn't get any votes." Asked whether Trump's public attacks on Mueller's probe could amount to obstruction of justice, one source close to Rosenstein said tweets and other public statements would be "in the mix" of any obstruction investigation, but "they're far from conclusive in proving corrupt intent." And, the source noted, "there is a First Amendment." Trump has defended his actions as motivated by politics, not criminal intent. "There was no obstruction — unless you call obstruction the fact that I fight back," Trump insisted last year. In his final report, Mueller left the question of obstruction to Rosenstein and Attorney General William Barr, declining to conclude Trump committed a crime but making clear the evidence he gathered “does not exonerate” Trump. Rosenstein and Barr later decided Mueller's evidence didn’t prove the "corrupt intent" or "obstructive conduct" needed to file charges against Trump, as Barr put it in a letter to Congress last week. But Mueller never obtained one substantial piece of evidence: an interview with Trump. A Justice Department spokeswoman declined to comment for this article and a White House spokesperson did not respond to requests seeking comment.